Brønsted and Lowry have given us a simple definition of acids and bases: An acid is a proton donor and a base is a proton acceptor. Consequently, electrophiles and nucleophiles are species in organic chemistry that interact very much like acids and bases. Electrophiles are “electron poor”, therefore, are electron-loving compounds. Nucleophiles are “electron rich” compounds, also known as “positive-charge loving”, or “nucleus loving”. It is a nucleophile reactant that provides a couple of electrons to form a new covalent bond, we can say that it acts as a Lewis base. A Lewis base contains at least one lone pair of electrons, and a Lewis acid is a species that contains an atom that is at least two electrons short of a closed outer shell. Nucleophiles all have pairs of electrons to donate and tend to be rich in electrons. As you can see, they can be neutral or charged (of course, negative). Each of these examples above has lone pairs on an electronegative atom (C, N, O, S, X). Some bear a negative charge and is, therefore, more nucleophilic than neutral. Nevertheless, neutral molecules can still function as a nucleophile, because the lone pairs in these molecules represent regions of high electron density. Any atom that possesses a localized lone pair can be nucleophilic. The π bonds can also function as nucleophiles because a π bond is a region in space of high electron density (above and below the plane). Finally, the pair of electrons in a σ bond can, on occasion, also act as nucleophiles. This class of nucleophiles is probably more subtle and less commonly encountered than the previous two, but you might recognize it when you see it. As already mentioned, a stronger nucleophile is the one with a negative charge. Nucleophiles are a species that is donating a pair of electrons and, of course, with an increase in the number of electrons and its nucleophilicity, it will increase. So, as the electron density increases, nucleophilicity also increases. And therefore, the conjugate base is always a better nucleophile. Nucleophilicity increases as you go to the left along the Periodic Table i.e. as electronegativity increases, nucleophilicity decreases. This makes sense when you think about it, electronegativity – “greed for electrons” – is the opposite of nucleophilicity – “giving away electrons”. Note: It’s important to restrict the application of this trend to atoms in the same row of the periodic table; for instance, C, N, O, F, or Si, P, S, Cl. If we have a polar protic solvent (such as water, alcohol, carboxylic acids) it comes to hydrogen bonding between nucleophile and hydrogen from solvent. For example, if we have a fluoride ion (nucleophile) in a alcohol (solvent), this alcohol will participate in hydrogen bonding with a fluoride ion, creating a “shell” of solvent molecules around it. The fluoride will be significantly less reactive, as its individual pairs of electrons will interact with the electron-poor hydrogen atoms of the solvent. 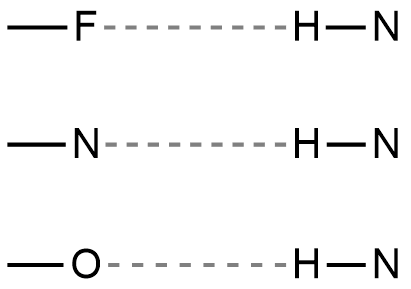 If we compare fluoride and iodide, iodide will also form hydrogen bonds with alcohol. But iodide is bigger than fluoride, and therefore, it’s going to be less tightly packed. On the of that, iodide is more polarizable. The strength of a nucleophile is also affected by polarizability. Polarizability describes the ability of an atom to distribute its electron density unevenly in response to external influences. Polarizability is directly related to the size of the atom and the number of electrons that are distant from the nucleus. So, if we look at halogens in the Periodic Table, the iodide will be the best nucleophile, and fluoride will be the worst. The ability of nucleophiles to participate in hydrogen bonding decreases as we go down the periodic table. Hence fluoride is the strongest hydrogen bond acceptor, and iodide is the weakest. In a polar protic solvent iodide is the best nucleophile, followed by bromide, followed by chloride, and then last of all is the fluoride. BUT the opposite is true in aprotic solvents. A polar aprotic solvent doesn’t hydrogen bond to nucleophiles to a significant extent, meaning that the nucleophiles have greater freedom in solution. Under these conditions, nucleophilicity correlates well with basicity. Basicity and nucleophilicity are related but they don’t have the same concept. When discussing nucleophilicity we’re specifically talking about donating a pair of electrons to an atom other than hydrogen (usually carbon). When a species is donating a pair of electrons to a hydrogen (more specifically, a proton, H+) we call it a base. Thus, fluoride ion, being the most unstable of the halide ions, reacts fastest with electrophiles. Conclusion: In polar protic solvents, nucleophilicity increases with polarizability, because hydrogen bonds form a shell around the less polarizable atoms and decrease their nucleophilicity. In polar aprotic solvents, this is not an issue, so basicity is the most important variable. 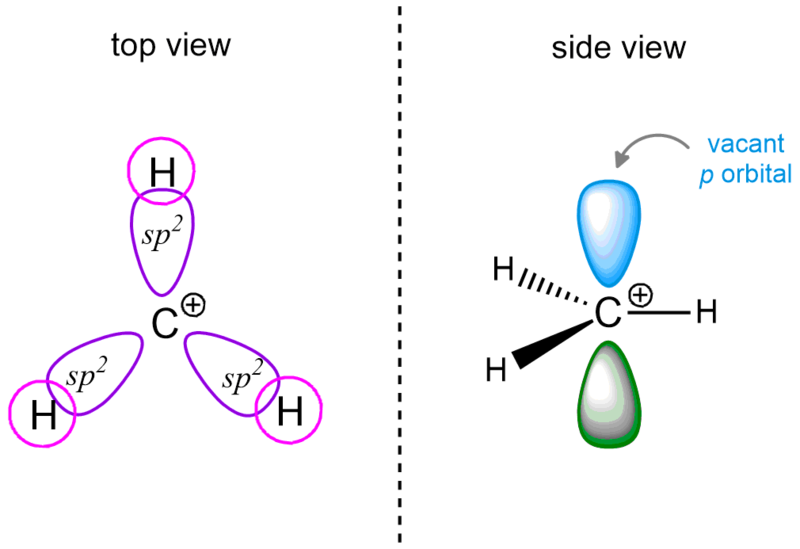 When discussing reactions in organic chemistry, we must take into account that orbitals at the carbon that participate in reactions are generally less accessible than protons are. The bulkier of the groups that are adjacent to a nucleophilic atom, the slower the reaction will be. This means that steric hindrance of the nucleophile makes it hard to react and therefore makes it a weak nucleophile. Carbocations often occur as intermediates in reactions in Organic Chemistry. It is therefore important to get acquainted with its characteristics. This will help you master carbocation intermediate reactions down the line including Markovnikov alkene addition reactions, unimolecular substitution SN1, β elimination E1, and so much more. This means that positive charge on the carbon atom of the molecule. For example, in SN1 mechanism the carbocation forms in the first step by the loss of the leaving group. Heterolytic bond cleavage results in the ionization of a carbon atom and a leaving group. In the starting compound, the carbon atom is sp³ hybridized. When the leaving group leaves, the carbon for which it was attached, becomes sp² hybridized with an empty p orbital sitting perpendicular to the molecule. Here’s another example – Addition of π electrons to an electrophile. One of the two carbon atoms involved in the π bond will have three bonds instead of four and bears the positive charge. Being electron-deficient (and therefore unstable), the formation of a carbocation is usually the rate-limiting step in these reactions. In the sp³ hybridized carbon atom, we have four attached substituents. 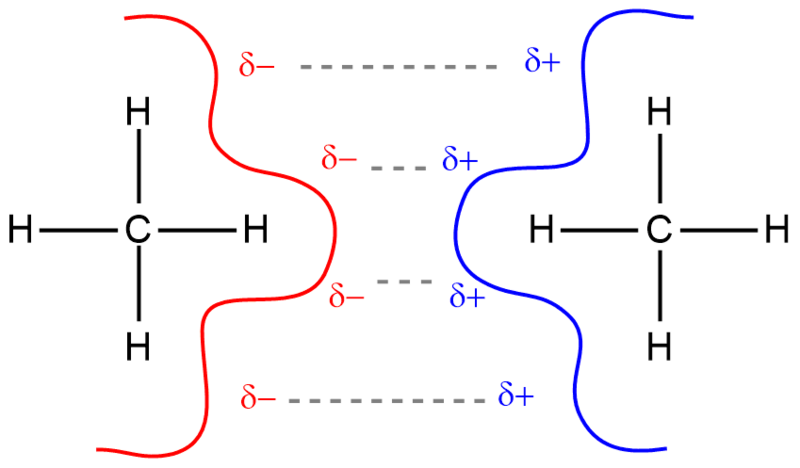 Each of these four bonds consists of 2 electrons (the octet rule). When one pair is removed, carbon remains only 6 electrons in total. Therefore, we say that the carbon is electron-deficient. Such a carbon is sp² hybridized. Carbocations are electron-poor: they have less than a full octet of electrons. 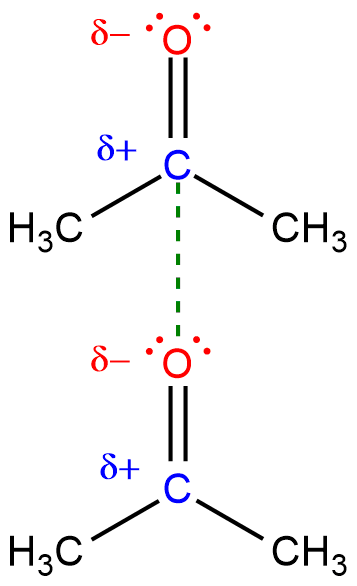 Tertiary (3°) carbocation – attached to three other carbon atoms ⇒ most stable. Why is the tertiary carbocation the most stable? In the tertiary carbocation, the electron-deficient carbon is surrounded by three methyl groups (the simplest example). These methyl groups are electron donating groups (EDG). As the number of these groups decreases around electron-deficient carbon, carbocations are becoming less stable. The methyl carbocation doesn’t have a methyl group to withdraw electron density from. The tertiary carbocation is plenty of electron density that can withdraw from and so it’s much more stable. Both hyperconjugation and resonance are forms of electron delocalization. They are distinguished by the type of orbital: Resonance normally refers to the π-type overlap of p orbitals, whereas hyperconjugation incorporates overlap with the orbitals of σ bonds. Hyperconjugation is the result of the overlap of a p orbital with a neighboring bonding molecular orbital, such as that of a C–H or a C–C bond. In a carbocation, the p orbital is empty. The alkyl group donates electron density to the electron-deficient center and thus stabilizes it. When we compare the orbital pictures of the methyl and tert-butyl carbocations, we can see that each methyl group increase the hyperconjugation interaction. The order of stability of the carbocations is a consequence of this effect. 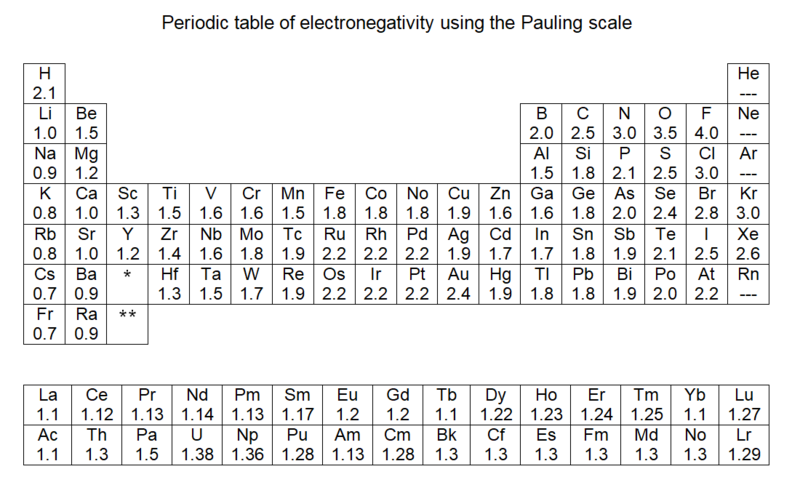 Another important thing to mention here is electronegativity. If you look at the C-H bond, carbon has an electronegativity value of 2.5, and hydrogen 2.1. We can see that the carbon is slightly more electronegative than hydrogen. 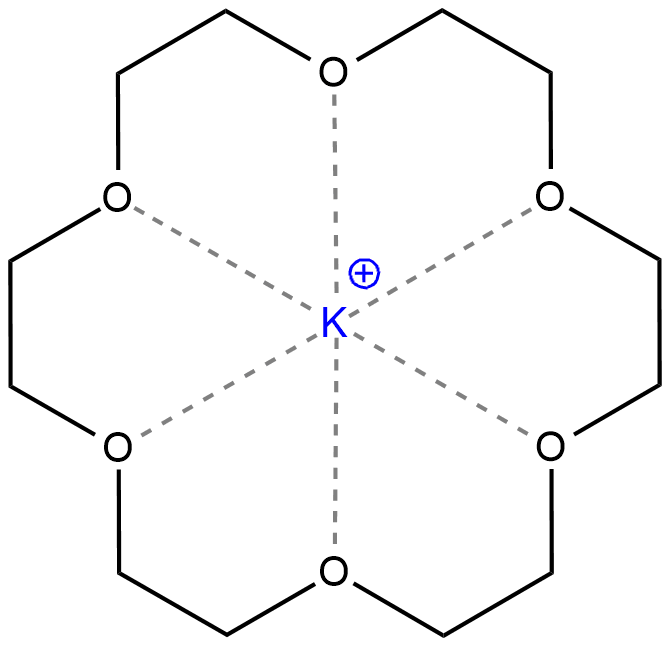 Thus, carbon pull electron density toward itself and, therefore, this carbon is a partial negative charge (δ-), and hydrogen is a partial positive charge (δ+). When we have a carbocation next to a partially negative carbon, this carbon can donate some density to that carbocation. In organic chemistry, we also encounter molecules for which there are several correct Lewis structures or resonance structures. They have the characteristic property of being interconvertible by electron-pair movement only, the nuclear positions in the molecule remaining unchanged. Question: How to determine the order of stability of these carbocations? REMEBER 1: as soon as you can draw the resonant structures of a carbocation, then this carbocation is more stable! And this is because the positive charge is shared by two atoms, not on the one. 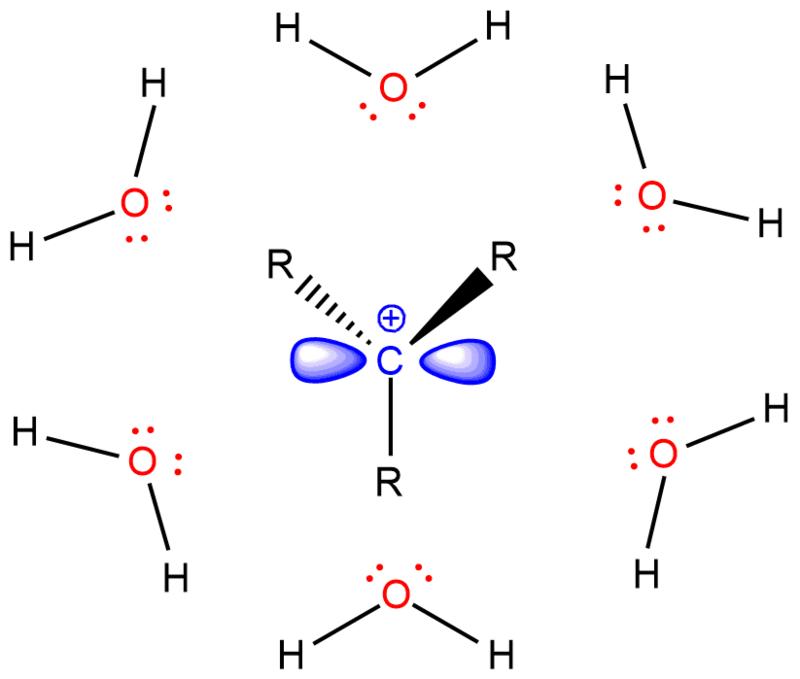 REMEBER 2: The more resonance structures you can draw, that is the carbocation more stable. In our example, the carbocation #4 is more stable than the carbocation #3. We have one more case in this example with primary carbocations (1 and 5). The carbocation #1 is a saturated carbocation which is stabilized by hyperconjugation. But carbocation #5 is vinylic carbocation (positively charged carbon is sp² hybridized, i.e. carbon of the double bond) and this is the least stable. The reason being is the positive charge directly on a double bond so we can’t draw any the resonant structures. The order of decrease of the stability of the carbocations is: 4 > 3 > 2 > 1 > 5. In some literature, you will find that the compounds with heteroatoms stabilized by resonance are a separate type of stabilization, but this is a resonance no matter which atoms are in question. The pKa table is very useful and it’s really important to become familiar with them. The pKa table tells you a lot more information than you realize. They don’t only tell you the pKa values for each set of species with certain functional groups, they also tell you the relative strength of each species. We can also predict whether a reaction will occur via the SN2 / SN1 or E2 / E1 mechanism, or it will be an acid-base reaction. The greater the pKa, the less acidic is the proton, and the less the pKa, the more acidic is the proton. 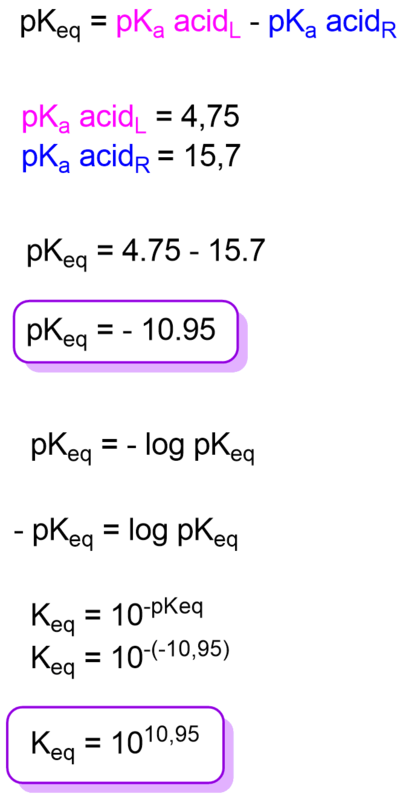 The pKa is equal to the negative logarithm of the Ka. Because of the way the logarithm function works, a smaller pKa means a larger Ka. Ka is called the acid dissociation constant. pKa and Ka describe the degree of ionization of an acid or base and are true indicators of acid or base strength because adding water to a solution will not change the equilibrium constant. pKa is helpful for predicting whether a species will donate or accept protons at a specific pH value. For example, if our acid is hydrobromic acid, the pKa of its proton is approximately -9. When the base removes this proton, a conjugate base of a hydrobromic acid (bromide ion) is obtained. As already said, the less pKa, the acid is stronger. This means that hydrobromic acid is a very strong acid. It can easily donate a proton. Therefore, the resulting conjugate base of this strong acid is a very weak base. A stronger acid will tend to react with a stronger base to produce a weaker acid and a weaker base. But if we have alkanes which have pKa approximately 50, donating a proton will be very difficult. This means that alkanes are very weak acids. Actually, they are the weakest acids. It would not be bad to remember number 16. Because he is here in the middle. Alcohols and water have this value (in fact, the water has 15.7 but we can say 16). They are practically neutral. Compounds with pKa higher than 16 are bad acid, and lesser than 16 are good acids. 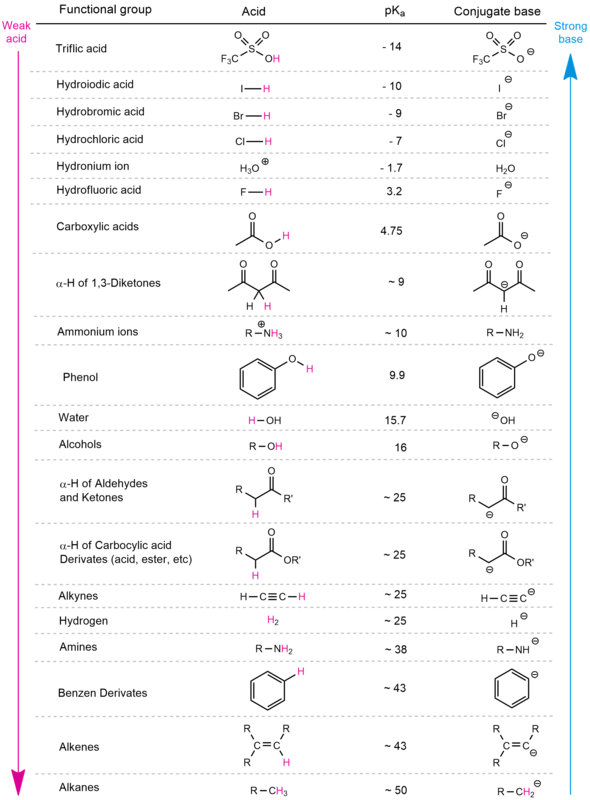 Most acids that we will see in organic chemistry are weak. This means that they have high pKa values. The nomenclature is a very important part of organic chemistry. The names are not given only to compounds but also to the carbon atoms that make up this compound. Thus, we can classify carbon atoms as primary, secondary, tertiary, or quaternary. These terms refer to the substitution level that a given carbon has in a molecule. In other words, these terms are used to describe how many other carbons a given carbon is attached to. This classification applies only to saturated carbons. Quaternary (4°) carbon atom – bonded to four other carbon atoms. This can be explained by one of the important properties of carbon and is its tetravalency. Carbon is a strict octet follower, which means it needs a maximum of 8 electrons to form stable compounds. Since a carbon atom has 4 valence electrons, it can form up to 4 bonds with different elements. Part of the reason why there are millions of compounds of carbon is its ability to form a very stable bond with another carbon atom. The same terminology is used for carbocations. A primary carbocation is attached to one other carbon, a secondary to two, and a tertiary to three. A quaternary carbocation does not exist without violating the octet rule. 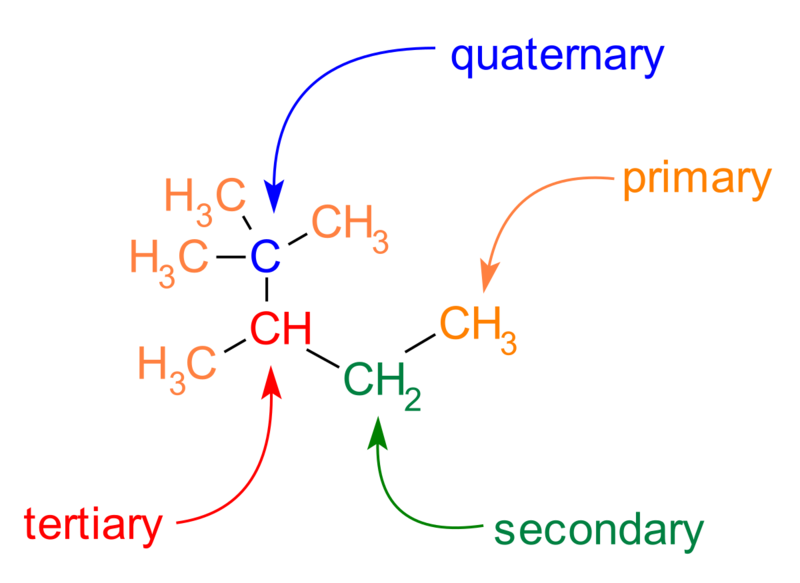 For example, you get the following compound to determine which primary, secondary, tertiary, or quaternary carbons are. As mentioned above, a primary is attached to one carbon atom, a secondary to two, a tertiary to three, and a quaternary to four other carbon atoms. For each carbon atom, you need to count how many carbon atoms next to it that particular carbon atom is connected to. Quaternary carbon atoms have the most carbon atoms around (max 4). Tertiary hydrogen atoms are attached to tertiary carbon atoms. In our example, we have a total of 18 primary hydrogens. Because each primary carbon has 3 hydrogen atoms, and we have 6. Secondary hydrogen atoms have a total of 4 (2 hydrogens per secondary carbon atom), and tertiary 2 (1 hydrogen per tertiary carbon atom). Let’s go back to the carbons. Let’s look at what are called carbons that are bonded to other atoms and atomic groups such as halides, hydroxides, amines. It should also count here how much carbon atoms are attached to a particular carbon. Halides (fluorine, chlorine, bromine, or iodine) are not counted. Thus, the primary alkyl halide is one that has only one carbon atom bound to itself. The secondary has two carbon atoms and a halide, and the tertiary has three carbon atoms and a halide bonded to itself. The quaternary alkyl halides don’t exist because that would involve breaking the octet rule. The rules apply the same way for alcohols as it does for alkyl halides. For the most groups like alcohols, alkyl halides, and hydrogen atoms to determine if it’s primary, secondary, or tertiary, look at the carbon atom that bears those atoms, ignore this atom or group and count how many carbons are attached to it. Here is a slightly different story. Amines are named according to the number of carbons attached to nitrogen. Primary, secondary, and tertiary amines are nitrogens bound to one, two and three carbons, respectively. They also form quaternary amines, since the nitrogen has a lone pair and it possible to form another bond to carbon. They bear a positive charge on nitrogen and are not at all basic. They are often referred to as quaternary ammonium salts. Numbers of carbon atoms attached to carbon atoms also govern how they will react. For carbocations, that is cations if carbons, carbons with more carbons attached on (i.e. tertiary) tend to be less electron-deficient due to hyperconjugation from nearby C-H bonds. Therefore, tertiary carbocations are more stable compared to secondary, primary, and methyl, respectively. Another case is that of alcohols. Primary alcohols can be oxidized to aldehydes and carboxylic acids (two levels). Secondary alcohols can go only one level of ketones, and tertiary alcohols cannot be oxidized at all. Organic chemistry is reduced to consideration of the reactions and mechanisms of organic compounds. Learning how to name organic compounds is the foundation upon which your entire organic chemistry knowledge will be based. The nomenclature of the linear molecules is simple, but when these molecules begin to branch, the naming of organic compounds becomes very complex. 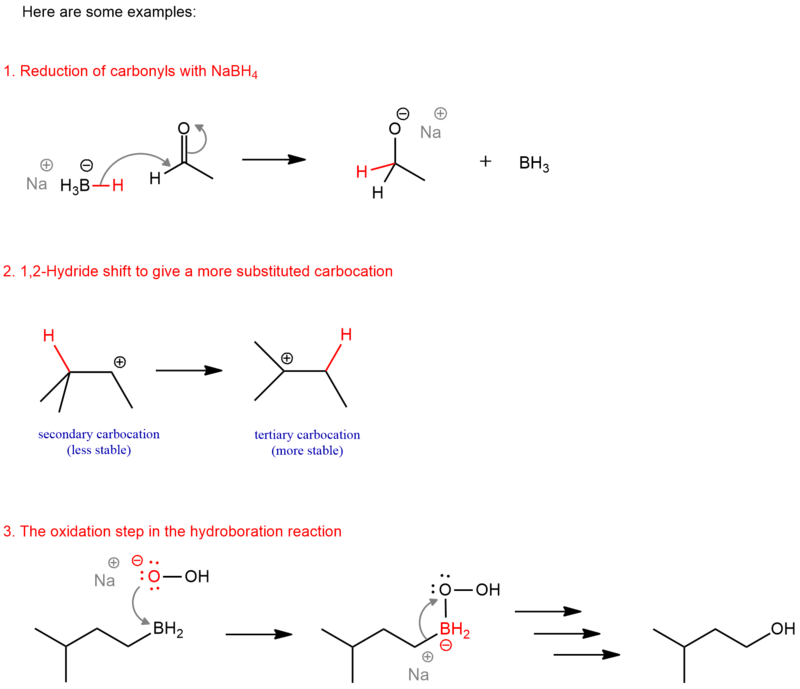 The first situation we encounter is branched alkyl substituents on alkanes. So let’s consider the simplest example, and it is butane (alkane) or butyl (alkyl group). Butane has four carbon and thus two possible structures. 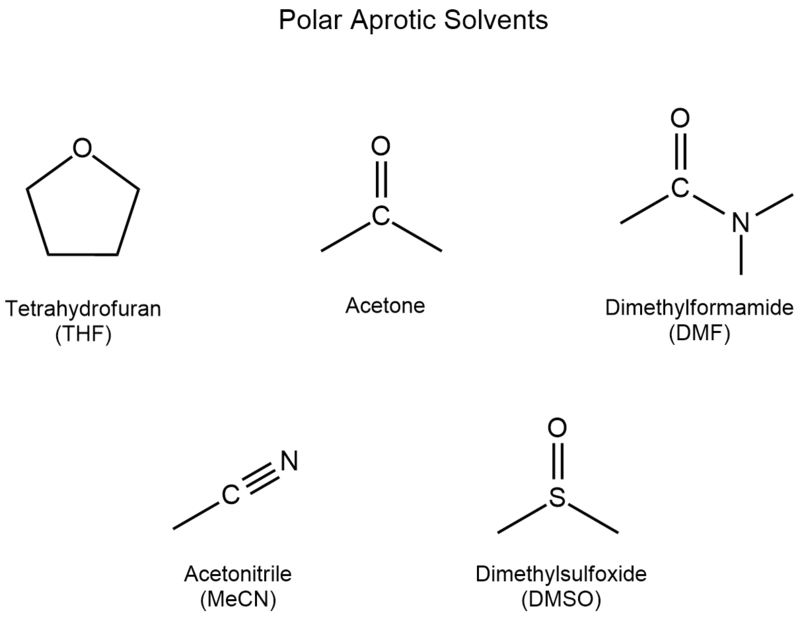 These are the so-called structural isomers. One is the 4-carbon straight chain which is call n-butane (“n” like normal), and the other is the 3-carbon chain with a methyl group on C2. It is called 2-methyl propane, or isobutane. Thus, the name of our compound in this example is 5-(2–methylpropyl)decane or 5–isobutyldecane. INTERmolecular attractions are attractions between one molecule and a neighboring molecule. And you have to be careful and distinguish INTERmolecular and INTRAmolecular forces. The names are similar to them but intramolecular attractions are the forces of attraction which hold an individual molecule together. So, INTERmolecular forces are forces between molecules, and INTRAmoleculae forces are forces within molecules. It occurs in ionic molecules where the ionic bond is formed by the complete transfer of valence electron(s) between atoms. This means that ionic forces are interactions which occur between charged atoms or molecules. Positively charged ions are called cations, and negatively charged ions are called anions. The attractive forces between oppositely charged ions are described by Coulomb’s Law, in which the force increases with charge and as decreases as the distance between these ions are increased. The highly polarized (charged) nature of ionic molecules is reflected in their high melting points as well as in their high water solubility. These forces occur when the partially positively charged part of a molecule interacts with the partially negatively charged part of the neighboring molecule. between these two atoms are four electrons (of the double bond). therefore, carbon loses little electron density and becomes partially positive charged (δ+). Because there are two different poles (a positive and a negative pole) this means that we have a polarized double bond, that is, a polarized molecule. Acetone is a relatively polarized molecule. And as we already know that opposite charges attract so the negatively charged oxygen is going to be attracted to the positively charged carbon. This electrostatic attraction between these two molecules is called dipole-dipole interaction. This is the force that will hold these two molecules together. In order to break this interaction, you would need a energy. The boiling point of acetone is 56°C and it would be liquid at the room temperature (25°C). This has to do with the intermolecular force of the dipole-dipole interaction that holds these molecules together. 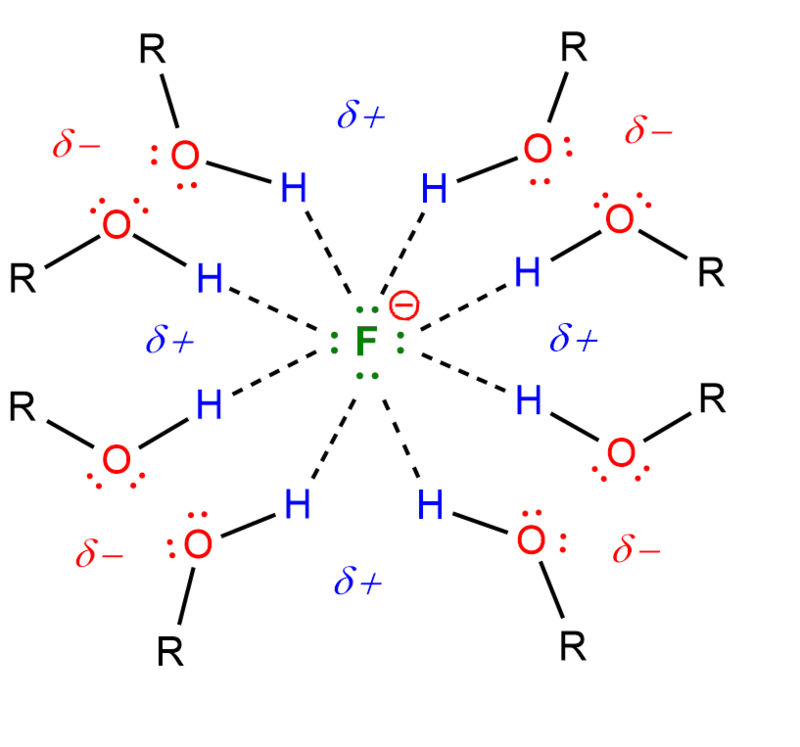 Hydrogen bonding occurs in molecules containing the highly electronegative elements F, O, or N directly bound to hydrogen. We will explain in the example of water. 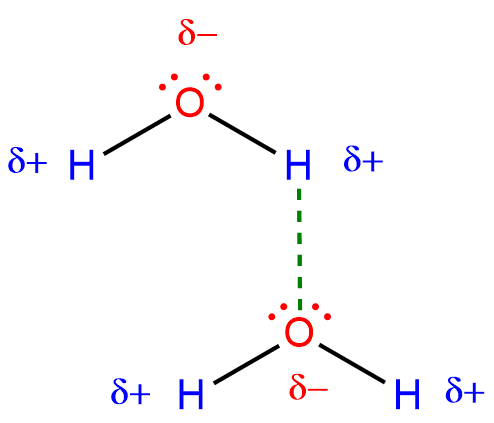 We have the same story as with acetone: oxygen is more electronegative than hydrogen, and it will draw electrons from the O-H bond closer to itself, giving oxygen a partial negative charge (δ-). The hydrogen loses little electron density so it becomes partially positive (δ+). Between the hydrogen of one molecule and the oxygen from the other, there is an electrostatic attraction (between two opposite charges), and this is a hydrogen bonding. As we see, this is a polar molecule and everything is similar to the one in the previous example. This attraction looks like a dipole-dipole interaction but this is actually a stronger version of dipole-dipole interaction but is called hydrogen bonding. This explains the exceptionally high boiling points and melting points of compounds. For example, the boiling point of water is 100°C which means that water is liquid at the room temperature (25°C). And if we would like to break the relationship between these molecules, it would take more energy or more heat is needed to convert it to gas. So the hydrogen bonding is stronger than the dipole-dipole interaction. The weakest intermolecular forces of all are called London dispersion forces. These exist between all types of molecules, whether ionic or covalent—polar or nonpolar. The more electrons a molecule has, the stronger the London dispersion forces are. When we look at these two methane molecules, we have a carbon that is surrounded by four hydrogens. There is a very small difference in the electronegativity between carbon and hydrogen that can be disregarded. Therefore, the methane molecule becomes nonpolar as a result. The electrons in these bonds are constantly moving. And when at one moment, for example, in the left-hand molecule are situated on its right side, in the neighboring molecule the same happens. So, the right negative side of the left molecule and the left positive side of the right molecule are attracted. This attraction is very small and makes London dispersion forces the weakest intermolecular forces. And since it is weak, we can expect the boiling point for methane to be extremely low, which is true. The boiling point of methane is -164°C which means that it is gas at the room temperature. As we have already said, the more electrons the molecule possesses, the London dispersion forces are stronger. In this way, increasing the number of carbons (more carbon more electrons) will increase the number of attractive forces that are possible. With this increase, the boiling point will also increase. 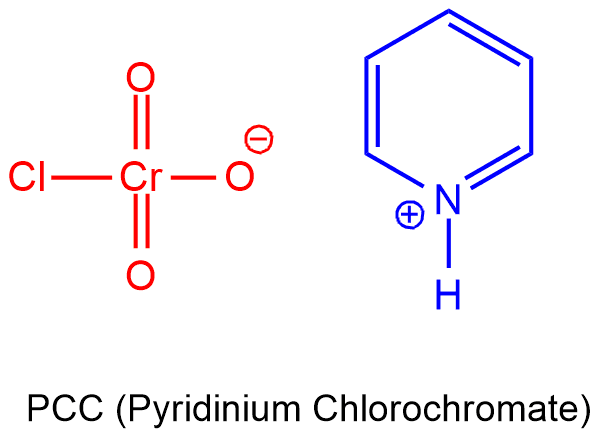 Pyridinium chlorochromate (PCC) is an oxidizing agent which can oxidized alcohols to aldehydes and ketones. PCC is formed from the reaction between pyridine, chromium trioxide, and hydrochloric acid. Chlorochromatic acid can be prepared by the dissolution of chromium trioxide in aqueous hydrochloric acid. Addition of pyridine gives pyridinium chlorochromate as orange crystals. It is soluble in many organic solvents (especially in dichloromethane at room temperature). One disadvantage to the use of PCC is its toxicity, which it shares with other hexavalent chromium compounds. PCC oxidizes primary alcohols to aldehydes and secondary alcohols to ketones. Unlike chromic acid, PCC will not oxidize aldehydes to carboxylic acids. A variety of related compounds are known with similar reactivity. 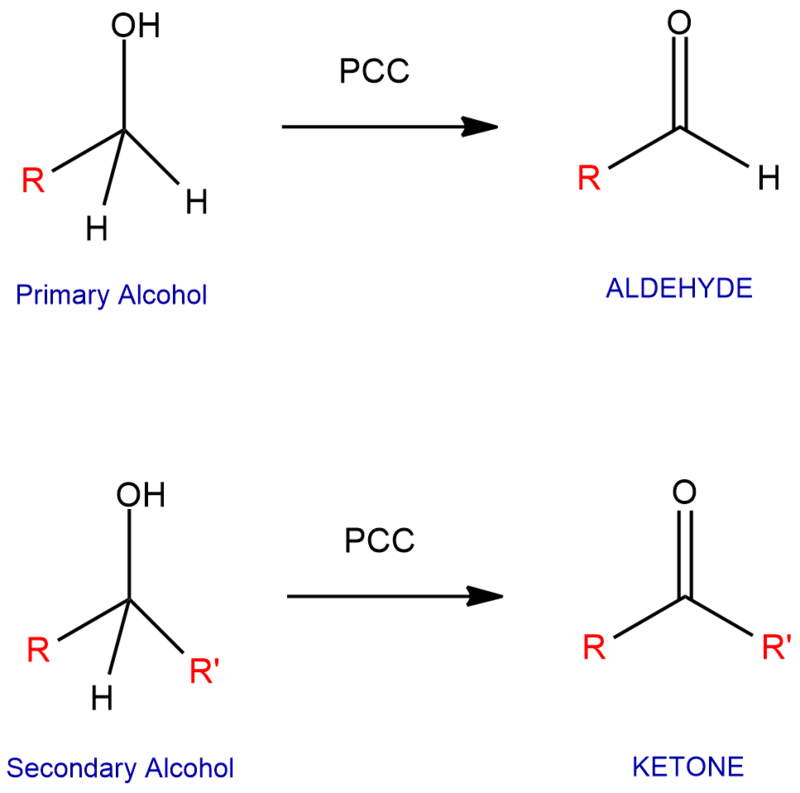 Although no longer widely used, PCC offers the advantage of the selective oxidation of alcohols to aldehydes or ketones, whereas many other reagents are less selective. The mechanisms for these reactions are the same and consist of four steps. We can see them on the above-marked pages. These reactions of this sort are actually a kind of elimination reaction. We are going from a carbon-oxygen single bond to a carbon-oxygen double bond which means that two groups are eliminated. This is achieved if we have a good leaving group attached to oxygen or chromium. This leaving group will be displaced when the neighboring carbon-oxygen bond is broken with a base. The pKa values are used a lot in organic chemistry. Understanding the proper use of a pKa table will give you the ability to recognize which acid-base reactions will happen and which will not. Recall that pKa is equal to the negative logarithm of the Ka. And the lower pKa value the stronger the acid. 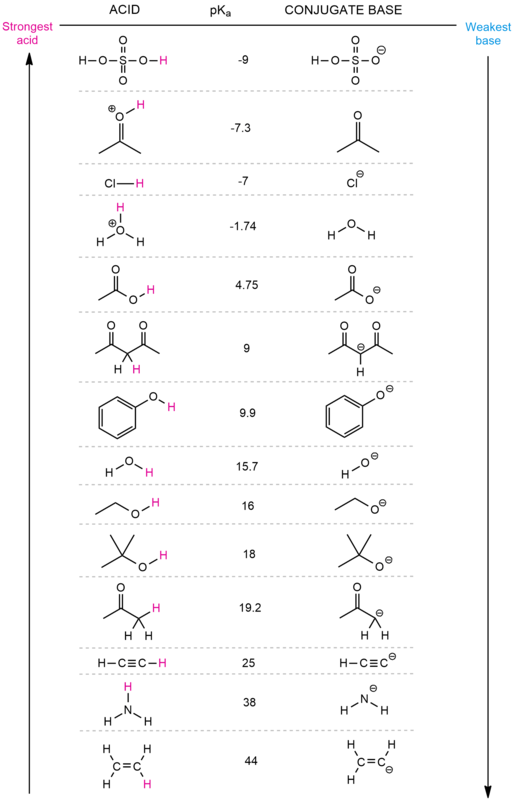 In the following pKa table, molecules are rank in order of their acidity, from strongly acidic to weakly acidic. The order of base strength is the inverse of acid strength. For example, if our acid is H2SO4 (sulfuric acid; first in the table), the pKa of one of the protons is approximately -9. When the proton is removed by a base, a conjugate base (bisulfate ion) of this acid is obtained. As you can see, the sulfuric acid is the first on the list with the lowest pKa value which means that this is the strongest acid on the list, and its the conjugate base is the weakest base on the list. The conjugate base of a strong acid must be weak to resist reprotonation. If it is easy to lose a proton it should be really hard to regain it, otherwise, you wouldn’t have a strong acid. A stronger acid will tend to react with a stronger base to produce a weaker acid and a weaker base. In the following reaction to predict the position of equilibrium, we must determine what will be the acid and what will be the base on both the left and the right. The base takes the acidic proton to give the conjugate base. This means that the hydroxide ion functions as a base and the acetic acid functions as an acid. But when we look at the reverse reaction, a water functions as an acid, and acetic ion functions as a base. The acetic ion is a conjugate base of acetic acid, and the hydroxide is a conjugate base of water. When we compare the values of pKa of these acids (acetic acid and water), we see that on the left side there are 4.75 and on the right 15.7. As the equilibrium favors the weaker acid, it will be acid with a higher pKa value. In this case, this will be water with higher pKa value. This means that the equilibrium lies to the right. As mentioned above, the pKa is the negative logarithm of the Kaa. So, the pKeq will be the negative logarithm of the Keq. As we know from general chemistry, when the equilibrium constant is much greater than 1, the equilibrium lies to the right. We have a large amount of product compared to reactants. A solvent is a substance that dissolves a solute resulting in a solution. Solvents can be classified into two categories: polar and non-polar. Polar solvents contain bonds between atoms with very different electronegativities, such as oxygen and hydrogen, and have large dipole moments. Non-polar solvents contain bonds between atoms with similar electronegativities, such as carbon and hydrogen. These polar solvents are capable of forming hydrogen bonds with water to dissolve in water whereas non-polar solvents are not capable of strong hydrogen bonds. 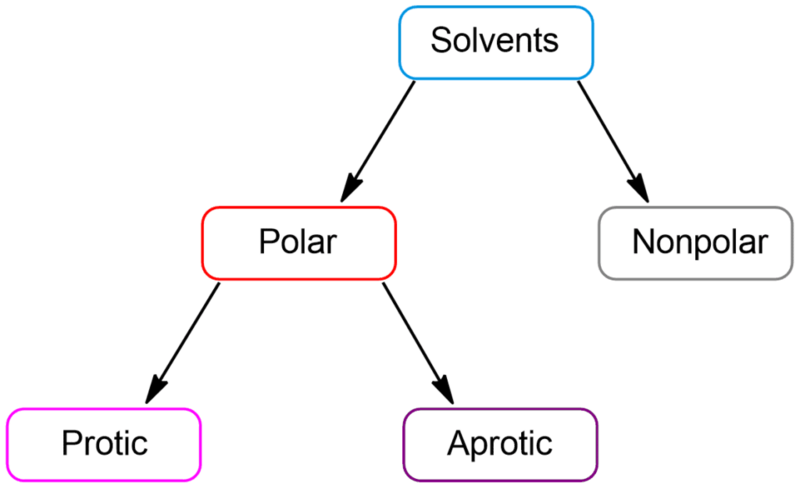 Polar solvents can be further divided into protic and aprotic. 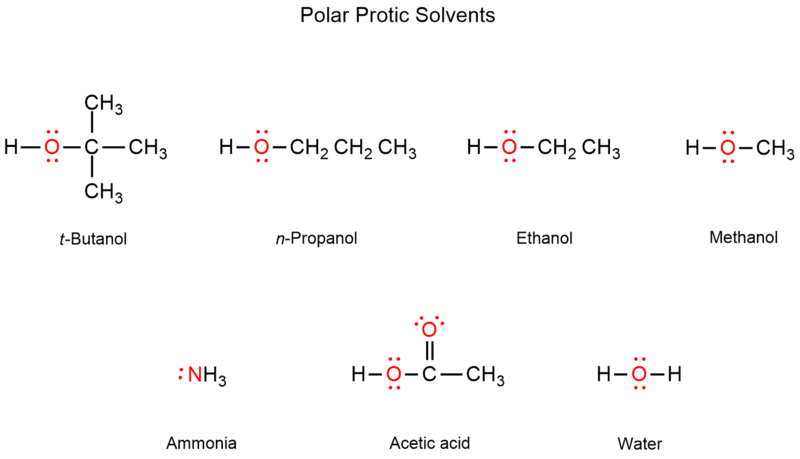 Polar protic solvents are capable of hydrogen bonding because they contain at least one hydrogen atom connected directly to an electronegative atom (such as O-H or N-H bonds). They solvate cations and anions effectively. Polar protic solvents are water, ethanol, methanol, ammonia, acetic acid, and others. Polar aprotic solvents contain no hydrogen atoms connected directly to an electronegative atom and they are not capable of hydrogen bonding. These are acetone, dimethyl sulfoxide, DMF (N,N-dimethylformamide), acetonitrile, HMF (hydroxymethylfurfural), crown ethers and others. These two different kinds of solvents have different effects on the rates of SN1 and SN2 processes. In those reactions, the use of polar protic solvents favors the SN1 reaction mechanism, while polar aprotic solvents favor the SN2 reaction mechanism. The SN1 reaction works well for tertiary alkyl halide because the loss of the leaving group forms a tertiary carbocation which is the most stable form of carbocations. A polar protic solvent will stabilize this carbocation. But SN2 reactions do not work well in polar protic solvents because these solvents weaken the nucleophile making it less nucleophilic. This can be explained by the case of fluoride or iodide in the protic environment, for example in alcohol (ROH). The negative charge of the fluoride ion is stabilized by the partial positive charge of hydrogen. Polar aprotic solvents work very well for SN2 reactions because they do not solvate nucleophiles. For example, if we have potassium fluoride and crown ether as a solvent, this ether will solvate potassium, not fluoride. Then, the fluoride will be free to participate in the reaction with a substrate. The effect of polar aprotic solvents on the rate of SN2 reactions is significant. The rate of this reaction is highly dependent on the choice of solvent. SN2 reactions are significantly faster in polar aprotic solvents than in protic solvents. SN1 – a stepwise process in which a loss of the leaving group to form a carbocation intermediate followed by a nucleophilic attack. SN2 – a concerted one-step process in which the addition of nucleophiles and the loss of the leaving group occur simultaneously. SN1 – Unimolecular means that only one molecule (substrate) affects the rate of the reaction. This will be the step in which the substrate is involved. And this is the first step, the formation of a carbocation. SN2 – Bimolecular means that both substrate and nucleophile are included in the rate equation. Therefore, the rate is dependent on both the concentration of substrate and that of the nucleophile. SN1 – As we already know that tertiary carbocation is the most stable form of carbocations, the tertiary alkyl halide will be the most suitable starting material. With this substrate, the reaction will be frequently. But, if we have a secondary alkyl halide with a good leaving group in a polar protic solvent, the reaction occurs relatively slow. Then, if we have secondary carbocation with secondary carbon next to the quaternary, the rearrangement occurs and formation of a more stable carbocation. Methyl and primary alkyl halides are too high in energy and these reactions have not been observed. SN2 – This reaction works frequently and rapidly with primary alkyl halides. The steric hindrance is a crucial thing and how it increases so the rate of reaction decreases. With secondary substrates relatively slow (best with high concentrations of good nucleophiles in polar aprotic solvents), and with tertiary extremely slow, often says it is not observed. SN1 – Nucleophiles are weak and neutral. These are usually solvents such as CH3OH, CH3CH2OH, H2O, and others. SN2 – Nucleophiles are strong and negatively charged, and these can be CH3O‾, CN‾, RS‾, N3‾, HO‾, and others. 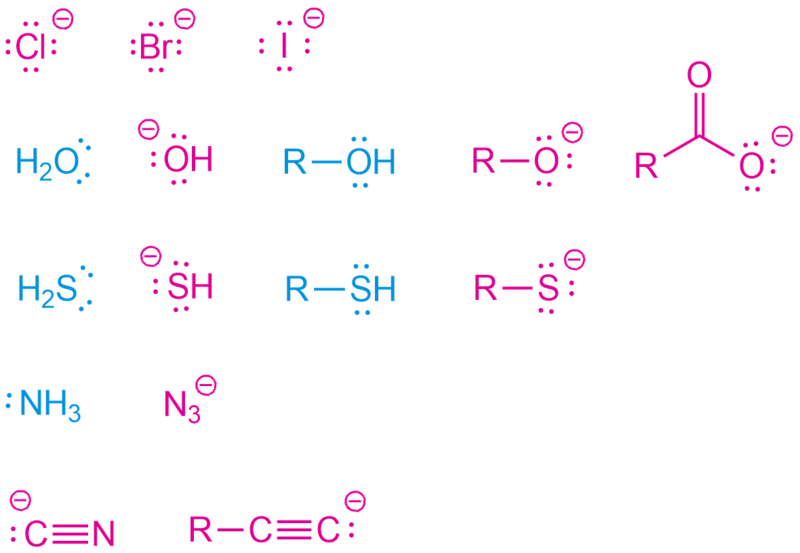 Sv1 – Solvents in these reactions are polar protic such as water, alcohols, and carboxylic acids. SN2 – Solvents in these reactions are polar aprotic such as acetone, DMSO, acetonitrile, and DMF that are polar enough to dissolve the substrate and nucleophile but do not participate in hydrogen bonding with the nucleophile. SN1 – There will be a mixture of retention and inversion because the nucleophilic attack of the solvent can be carried out on both sides of the planar structure of the carbocation. SN2 – If the substrate has a stereocenter, this reaction will give inversion of configuration.